Disclaimer: I want to thank MoarPizza for providing this excellent template for build guides. Welcome to the guide for my Ichimonji Cleave Gladiator I am currently playing on HSC. Let me start off by saying that I will try to make this guide as beginner friendly as possible, since it - in my opinion - is a good build to get started with. The purpose of this build is to utilise the unique sword Ichimonji, which is done by using as many buffs as we can. This does not mean using all available buffs, but merely the most beneficial ones. I chose the Gladiator ascendancy since this in particular focuses on dual-wielding; we want to dual-wield to get the sweet 20% increased effect of buffs, 10% from each sword. The sword has the downside that you cannot be affected by auras from other players, and you cannot affect other players with your auras. This means that this specific build is not the best suited for group play. That being said, you can still do it, just without the mutual benefits of the auras. I chose to focus on this particular sword because 1: I play solo most of the time, and 2: It is very rarely used (as far as I know!) and it has potential. The build is HC viable I would say, but the tree needs to be altered slightly and there is not as much room for uniques. I will not be covering a HC version of the build in this guide, but feel free to ask questions about it either as a reply to this post or in a PM. Note that the profile does not reflect this particular variant of the build, as I have recently converted into a more expensive version. Direct your attention to this guide for information on the budget version. If you have a specific map or encounter in mind that you would like me to show off, post a reply or send me a PM - I'll try my best to deliver. + Excellent Uber Lab farmer and Atziri farmer; face-tank both! + Fun! Most things explode in a gory mess! - Not the strongest single-target DPS, but Conc Effect helps a lot. Ascendancy Points: First Gratuitous Violence or Outmatch and Outlast (in the order you prefer, take the other one as 2nd). Then Painforged. The Uber Lab ascendancy is more flexible: I would recommend Blood in the Eyes as and offensive choice, or Versatile Combatant as a defensive choice - which one you prefer is up to you entirely! I went with Blood in the Eyes. When leveling, you start by rushing to Resolute Technique (RT), which will greatly increase both your effective DPS and the smoothness while you level. The inability to critical strike is made up for by "Your hits can't be evaded". We pick up some life along the way to RT, too. Next, we go grab some Area of Effect (AoE) nodes to further smoothen the leveling process, since Cleave has a very small radius from the beginning (this increases as you level the Cleave gem). If you choose to level as Cleave I recommend you pick up a jewel slot early on in order to use the Cleave jewel Overwhelming Odds. You don't have to level as Cleave; Sunder is another excellent choice, and also benefits from the increased AoE. We grab some damage here and there, but nothing that limits our choice of weapon to a specific base type. You'll want to path to the leech nodes early on, as this will improve your survivability a great deal while also taking care of any mana issues you may encounter. While at it, grab the dual-wield specific Ambidexterity. You might notice that I get a lot of resistances from the passive tree - this is to make gearing up easier, and you can spec out of these nodes later on, when your gear makes up for the resists. When you hit level 58, you are ready to put on your 2 beautiful Ichimonji swords, and go for the sword nodes on the tree. At this point the leveling process is extremely smooth, especially with Whirling Blades as your movement skill. I picked up an extra Frenzy charge, but this is not necessary. You can go for an Endurance charge instead, or something entirely different. This gives you free Fortify (20% reduced damage taken from hits), and a nice increase to AoE. Since Fortify is a buff, its value is increased by 20% due to us wielding 2x Ichimonjies. 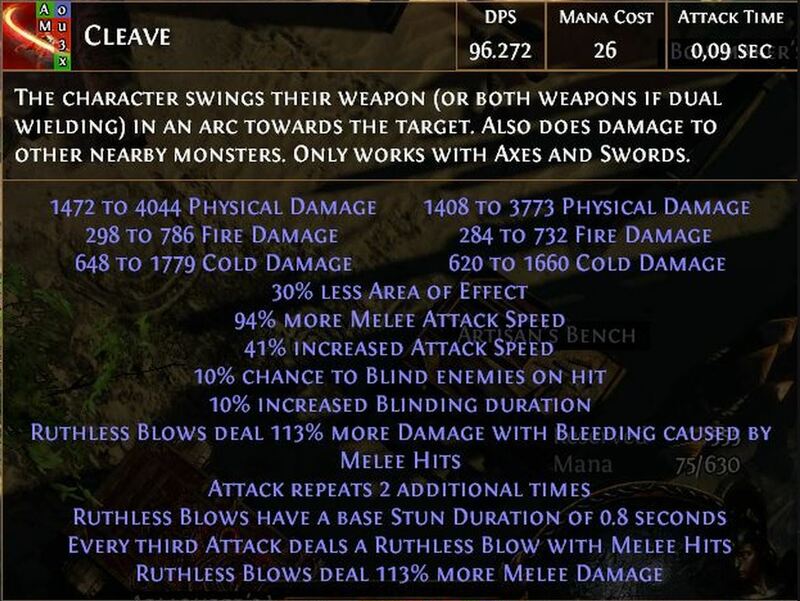 This brings it to 24% reduced damage taken from hits. Only grab one of these jewels, though - two is not worth it. | +2 mana gained for each enemy hit by your attacks. Must-have on one of your jewels. Mana leech from passive tree will take care of the rest. | % increases to damage that apply to you and your damage type. Keywords here are dual-wielding, melee damage, physical damage, swords, area damage, and one-handed weapons. | % increases to attack speed that apply in general, and/or to you and the weapons you are using. Keywords here are dual-wielding, swords, and one-handed weapons. | % increases to maximum life. This stat is very strong, thus greatly increases the price of the jewel, and is not needed for most content. I don't have life on any of my jewels, and I manage anyway. If you are to play this build on HC, prioritise life highest (price will increase, not-so-budget). | Elemental resistances. Through jewels you can cap the resistances you couldn't find on the rest of your gear. | Intelligence and Dexterity. While you might be able to find a lot of this on your gear, you might need to acquire some on your jewel(s) as well, in order to keep leveling your gems. An alternative is to grab one or more of the notable passive skills that give you +30 to intelligence or dexterity (for example Expertise and Ancestral Knowledge near RT). | Chaos Resistance. This is a Luxury really, but can help out a lot on some specific bosses and monsters. Not top priority, however, since chaos damage on monsters is the rarest type. I bought these for 1 chaos orb each. Remember to make sure that you have at least 40 strength within range of your Overwhelming Odds jewel. This is with Herald of Ash and Hatred; no charges, Punishment, flasks, or anything else. While mapping, your sheet DPS will be around 90-100k, and your real DPS even higher. Same buffs active as above. Swap Conc Effect in instead of Inc AoE for bosses to greatly increase your DPS. Above are my defenses as stated in the character sheet. This does not take into account Arctic Armour, Fortify, Endurance Charges, and flasks. 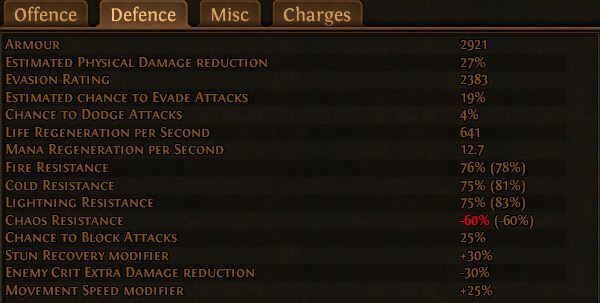 Endurance Charges: 3*4 = 12% additional physical damage reduction, and 12% to all elemental resistances. Note that these are not affected by the increased buff effectiveness; not to my knowledge at least. All in all, the defenses are great, and we can face-tank most bosses, including Atziri and Uber Lab Izaro! At the time of making this guide, each of these items can be purchased from poe.trade for 1 chaos maximum; some are only 1 alch or less. As you may notice, I use many unique items. This is because they are fast and easy to acquire, while also providing some special touches to the build. These items are NOT best in slot, and you can find or buy much better items for the same, or slightly higher, price; thus, still sticking to our budget. This weapon is the foundation of this particular build. While having mediocre DPS, it boasts some additional features that the build takes advantage of: First of all, it increases the effectiveness of buffs on our character buy 10%. Since we will be dual-wielding these, it totals to 20%. Furthermore, each sword gives us 5% reduced mana reservation, which allows us to run Hatred, Herald of Ash (HoA), and Arctic Armour (AA), without suffering from any mana issues nor needing an Enlighten gem. Another staple in this build. We use the BoR in order to effectively achieve a 7-link for our main skill, Cleave. The better alternative would be a 6-link body armour, but they are much, much more expensive than this helmet. An important note to this helmet is: While the helmet does state that we "Can't use chest armour", we can still have one equipped. This is done by first equipping an arbitrary body armour, then the helmet. This will disable the armour and gems in it, but any gems socketed in the armour will still gain experience as you go about on your killing spree. My advice is to equip an armour with as many sockets as possible (don't have to be linked) in this fashion. See "Helm" above for information. TLDR; we don't use one, but still equip one. I recommend rare gloves with life and resistances as top priorities. It is also easy to acquire any dexterity you might lack in order to fully level your gems on the gloves. An upgrade would feature attack speed, added physical damage, or strength, listed in order of priority. Boots is a versatile spot. There are many great unique boots, and you can try to browse through them here. That being said, I recommend rare boots with life and resistances as top priorities. Usually one would want movement speed on them, too, but we don't need that since we will be using Whirling Blades to move around; thus, it is a luxury for us. Another very versatile item slot. I would, however, highly recommend the unique amulet Bloodgrip, since we benefit greatly from all of its stats. Go with a rare amulet with life and resists if you have a hard time capping your elemental resistances. If you choose to go with Bloodgrip or another amulet without resists, this will make the transition to the non-budget version of the build easier, where we want to use Bisco's Collar. Cap your resists, get the stats you need to level your gems, and the rest is life, flat added physical damage to attacks, and attack speed (in order of priority). You might be able to squeeze in a unique ring, which you can find a list of here. Some can be very beneficial, such as Death Rush, or Mutewind Seal. If your resists are capped, feel free to pick and choose whatever belt you would like! However, I highly recommend the unique belt Belt of the Deceiver, which grants a 10% damage modifier against nearby enemies (Intimidation), in addition to good defensive and offensive stats. There are no flasks required for the build to work. That being said, I highly recommend the unique flask Atziri's Promise. It's very cheap and provides both offense and defense. Another great flask is Lion's Roar. This is, however, much more expensive (10c at the moment), and earlier in a league it will not be easy to obtain on this budget. It is a luxury that you can strive for. Make sure you have freeze and bleed removal on your flasks. 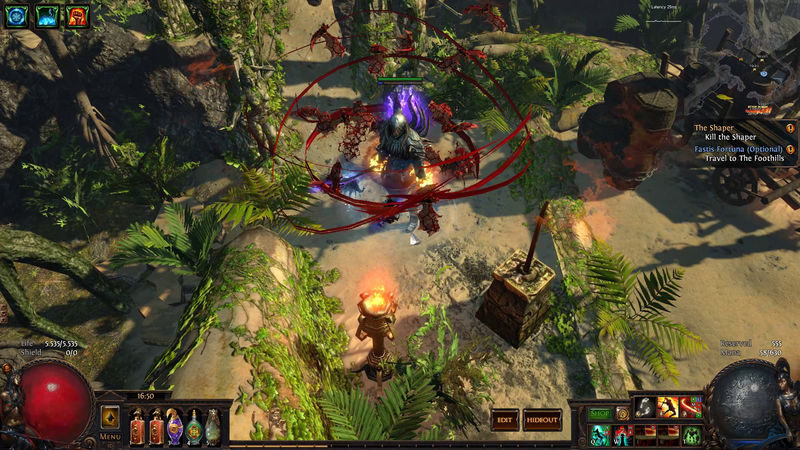 Curse removal flasks have been improved in 3.0, as they now remove rolled curses on maps, too! This is very strong, and highly recommended. Other solid choices are Immortal Call and Molten Shell, both purely defensive. We're fast now! We use Blood Magic since we cannot sustain our mana while whirling, and we don't notice the life cost. We also enjoy 20% increased effect of these buffs. If you have an Enlighten level 2+ available to you, throw it in there. This helps a lot on single targets! Excellent setup that should be staple in physical attack builds. Note that the Blood Magic gem can be swapped for e.g. Stone Golem or a Warcry (I suggest Enduring Cry for endurance charge generation on boss fights). Perhaps you are like me: You play solo almost all the time, and only enjoy the company of your golem. If you do not put your golem into your CWDT setup, I suggest you find another spot for it, since it helps a lot in the labyrinth. You can choose not to, it's mostly a quality of life. You can use whatever Pantheons you prefer, but I highly recommend Soul of the Brine King (Major), since we don't have stun immunity. Upgrade it fully when you can. I personally use Soul of Tukohama (Minor), since this allows me to face-tank more effectively. You can run reflect maps if you equip a Sibyl's Lament in your right ring slot, and use the Soul of Yugul (Minor) Pantheon. Since Sibyl's Lament has no resistances, it would be optimal if you can cap your resistances through your other gear, and leave one ring slot "open" to unique rings. As previously stated, you can choose to level as Cleave from the get-go. If so, pick it up once you reach Lioneye's Watch around level 2. Sunder will be available for you to switch to at level 8, if you so choose. The most important thing while leveling is your weapon; good weapons make the progress much smoother and the overall experience better. Luckily, this far into the league, good leveling uniques are relatively cheap. Here is a list of the go-to leveling uniques, some more expensive than others. I would definitely suggest picking up 2x Screaming Eagle, since you can use them early on (level 6), and keep using them a very long time. These axes have an upgraded version (you probably won't be able to upgrade them yourself) that has a higher level requirement and is much stronger. It's called The Gryphon, and requires level 32. It's somewhat more expensive, though, but a huge quality of life upgrade, and can be used until we swap into Ichimonji at level 58. In general, the leveling process should be straight-forward, and it's really nice that we get to use our end-game weapon so early on. Regarding placement of passive skill points while leveling, see the "Skill Tree" section earlier in this guide. Thanks for reading, I hope the guide is helpful. If you have any questions, feel free to post a reply, PM me here on the forums, or whisper me in-game. Following it now, currently level 40. Cant wait to equip my ninja swords! Just hit maps and easily hitting 200mil xp per hour. Have you thought about using the Crimson Dance node or some additional bleed nodes? How well do you think Lacerate would work with this? I personally don't like Cleave much, and Lacerate is one of my favourite melee skills. Thanks for the unique build idea! The DPS would be slightly worse with Lacerate, and you would miss out on free Fortify, which is a large defensive bonus. If you can manage to keep up Fortify somehow, Lacerate could work. Regarding you disliking Cleave, have you tried it later in the game? The skill is really underwhelming from the start, but as it gains radius it becomes much, much better! how much block chance do you have with this kind of gear?